Nathalie Angles (NA): In the history of work you have produced until now, drawing has always held a preeminent position but your practice is also very rooted in performance, with strong conceptual underpinnings. In a previous discussion, you mentioned that you incorporated performance into your practice at a later stage but that it was not so much of a shift as a transition. I would qualify your performative actions as acts of drawing as I would label your drawings as performative acts (when you execute your charcoal drawings, you exert a great deal of physical pressure with your body); Both performance and drawing informs, inspires and co-exists with each other. There is no separation really. "Performative installations" - can you define this term? Monika Weiss (MW): My works consist of elements that come both from past and from present, bringing an evidence of action, bearing traces, visual or virtual of something that has happened. 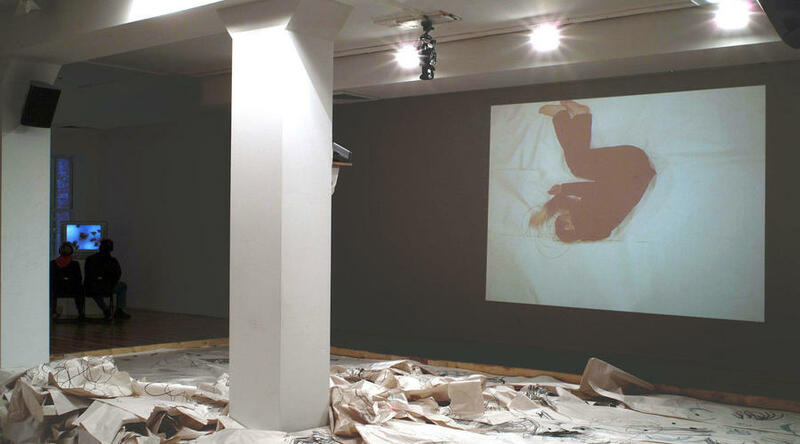 In that sense both drawings and installations are performative. I like to use this term the way Judith Butler does. NA: You define your use of drawing as an attempt to outline the world. Can you elaborate this concept to highlight the understanding of your practice? MW: Drawing captures an interval of time. Merleau-Ponty once talked about the "flesh of the world." There is a collision that we all live in, between the self and the world. That collision or gap exists in layers. First comes the boundary between the notion of the self and the understanding of the body as other. The relationship of body and the spaces around is addressed through the act of drawing. NA: In your discussion with William Anastasi, you refer to your body as" an immediate sculptural material" and that all materials that you work with are equal, human flesh, paper, sound technology, water, fluids... Are you interested in materiality? MW: I think of my body (and, by extension, of any body) as an environment, a space in a continuous state of flux. It is a great artistic material, as long as we don't treat the body as any different or more important then other elements, such as water, paper, stone, earth. By elements I mean the motionless things, that we usually think of when we think of "sculpture", but also sound, virtual image, language, and other people's presence. I try to look at human body as an object, not to diminish its dignity, rather to be able to be smaller, like a "grain of sand" as Agnes Martin would say. NA: When you prepare your performances, you establish a set of constraints that you follow during the action. You decide for example to be curled up during the whole performance in an embryo like position that appears to be a recurring type posture throughout your drawings and performative actions, or to keep your eyes closed for several hours. Your performative installations are vital and intense, and I would say that this is generated in part by the simplicity and economy of means that you choose to employ. MW: I want to emphasize that the gesture and the physicality of my actions derive from intellectual quest. From early on in my artistic development I started using a set of elements that resonated the most for me intellectually and physically, such as paper, black ink, water, bodily fluids, baptismal font. I prefer fewer elements, such as in my choice of material or my choice of specific action, that provide a sense of greater focus. NA: Delving further into your working process and the physicality of your working process, I was also interested to find out that you experiment with different types of paper whose physical properties vary as they come into contact with your body. Photographic backdrop paper that you use frequently, is very abrasive to your skin. Here, you used newspaper print for the first time, and you mentioned that this paper is overwhelmingly noisy as your body rolled back and forth on it. MW: Paper connotes human skin. For the "Limen/Meadow" (2004) I looked for paper that works well in multiple layers, and that tears apart easily. I am fascinated with the surfaces of industrial papers, which are made without concern for "artistic outcome" such as how the paint spreads or what quality of trace the charcoal stick leaves. I am interested in combining the surface of my skin and the surface of paper together, in the act of crawling or in the act of drawing. I like to imply similarities between surfaces. There is something infinitely beautiful about the fragility of the boundaries, in the way we immerse our hands in the surface of water, in how the surface of paper cracks and opens itself further to the underlying layers. NA: What about landscape in relation to the body? 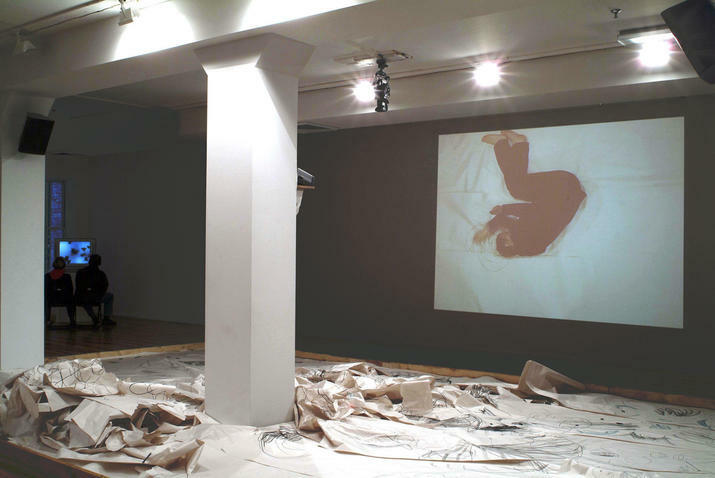 MW: When I lie on the ground the space opens itself up (as I change my point of view) as in the "Elytron" performance I did here (in Chelsea Museum) in 2003. The tension between human figure and landscape, visual and philosophical, has to do with the underlying fear of coming back to the ground, of dispersion. Standing up implies power. Lying down, curled up and with my eyes closed I give away that control, listening to the surface of the ground. NA: Let's shift to the subject of language, which has a profound presence in your work. The way you use language is very specific. You choose to qualify, or describe the series of works you develop over time with ancient Greek attributes such as "Achea Rheon" or "Ennoia". Are they intended as titles or do they have a different function? When we talked about your relation to language, you said that you "were striving to overcome language". MW: I don't consider them as titles really. Words are objects that carry histories and that often took a long time to build into complex meanings and paradoxes. Words that appear in my work are equal with other elements. They don't explain or summarize, rather co-exist and co- sound with other elements, offering a possibility of the unfolding of meaning. Reading Gnostic texts several years ago I encountered "Ennoia" which in old Greek signifies "consciousness" and "a though in mind." In their cosmology "Ennoia" was a small particle of light or of spirit that has accidentally collapsed into this world. This notion resonates with my interest in mater as colliding with the self. I also like the way "ennoia" sounds, an annoyance, something slightly unpleasant and talking a long time. I like the way in Julia Kristeva's writing there is a sense of circularity, where no conclusions can be made. I am interested in that circularity or repetition, which implies inability or muteness, impossibility to articulate. I think language can address that inability in powerful ways. NA: The baptismal font as sculptural object is a recurring motif in your performative installations and drawings - In "White Chalice" - exhibited at the Chelsea Museum - drawn in charcoal and fluids that you poured directly onto the canvas- you have outlined the font directly onto the support. Some years ago, you came across a baptismal font in a church in Poland that left a deep impression on you, particularly in terms of its scale when you realized that you could actually look inside it and that as a sacred object, the strongest sensation you experienced was its physicality - and this came to you as a kind of revelation in terms of its physicality. You reproduced the model of this font in concrete such as in this early model, "Koiman" you placed a skin like layer made out of rubber latex, which has human skin properties inside; then more recently you cast a model in resin and polypropylene. In "Koiman", you filled the concrete replica with motor oil that overflowed intentionally. It was not until later that you began to immerse your own body inside the font. How and why did this transition occur? MW: I think ever since I saw the font in the Church in Wroclaw (and as you all know until about the fifteenth century, people were baptized as adults with their entire bodies immersed) I began obsessing about the act of immersion, and imagining figures inside the basin. The function of these fonts was revealed to me in a visceral way, I guess I was attracted to that vision as an artist. I was making hundreds of drawings of my body inside the vessel years before I began immersing my actual body. When I created "Koiman", I put eighty gallons of motor oil inside the concrete vessel that overflowed continuously. I was drawing sketches of myself immersed inside the vessel despite toxicity of the oil. I didn't think they were realistic drawings. Drawings in my practice often precede an action, or equally they come as an aftermath. NA: As I looked through slides of your older work from the early to mid 90's, they consisted mainly of drawings in black ink and also oil paintings, and if we compare them to the very recent "Drawing with Body, Drawing with Sound" which was a performative installation where you invited Vitiello to record the sounds of your drawing body, the marks and the resulting forms of the earlier drawings bear surprisingly similarities. In the earlier works you used your bare hands with eyes open and you would immediately erase the emerging form/figure with your entire arm. In recent performative production one can see the emergence of similar shapes that are created by your entire body that is curled up in a very uncomfortable position during several hours. Your eyes are also closed! MW: The intensity of moment, both in drawing and in performative action, share similar qualities of intention, and focus. In both the drawings and the performances I don't stop, I don't "come back" in the sense of "mastering" the piece. Each gesture, mark, has its own integrity and meaning. NA: You talk about "mark" and I would describe your performative installations as "mark making" rather than "trace making". There is a very fine distinction between the two... "Mark" is defined as " a visible indication made on a surface" whereas "Trace" is a "visible mark left by the passage of a person or animal or vehicle". If we look at the tradition of mark making in relation to your own work, there are possible connections to make with the Gutai movement that emerged in the mid fifties where artists used their bodies to create two-dimensional works with paint or mud or made picture planes of paper. Also comes to my mind Paul Mc Carthy's famous performance when he painted a white line with his head as he dragged himself along the ground. Naim June Paik did something very similar. Rebecca Horn's performance "Bleistiftmaske" is another reference, where she wore a mask from which protruded rows of sharpened pencils arranged so that she could draw with her head. Do you have any particular affiliation with some of these artists or others? MW: I discovered this specific Naim June Paik's action through a Japanese curator who came to visit my studio and thought of that connection. I am interested in the history of mark making in art as a history of revolt against the "eternal darkness" (as the Dostoyevsky's protagonist in the "Idiot" Myshkin said as he stood in front of Hans Holbein's "Dead Christ" painting). Mark-making is about gesture. It appears to be hopeless and insignificant yet it provides an evidence of existence, its "trace". I have always been sensitive and attracted to stains, puddles, leakage, which result from overflow, the impossibility of containment . NA: You referred in an earlier discussion to your attraction to "severe beauty" - such as in Holbein's "Dead Christ" where the figure is portrayed very realistically with a cold gaze, where the artist uses a reduced palette of colors. I see something of this "severe beauty" quality in your work. At the same time your work certainly has its own place in the larger context of performance art and women artists protagonists, who since the 60's - namely over the last forty years - have made some of the most intense and sustained work in the area of performance and process work. Many feminist performance works came out of these artists own life experience and were intended as political analysis and social critique? How do you fit in this picture? Is there a political agenda in your work? NA: The physical challenges you impose to your body could also be interpreted as some kind of redemption attempt. On the other hand, 70's feminist art and artists also used their own bodies in dangerous situations. MW: The challenges I impose on my body are not great - I am interested in states of being tired through repetition or through self-imposed constraints. I respect feminist artists who endanger their bodies though my own investment is different. Defining where the difference lies is not easy to pin point, all I can say is that these performances such Marina Abramovic's (let's say when she hangs form a wall in the space attached to a bicycle chair) have somewhat dramatic aspect, there is a culmination, or a catharsis involved. In my performative installations I don't offer redemption. One enters an ambiguous space of repetition and ritual, where the meaning is gradually erased. I submit myself to space. NA: In some of your works there are Catholic iconographic references - which leads me to ask about the relationship of your work to the Catholic religion. Despite your at times direct use of Catholic imagery such as baptismal font series) it is not at all obvious to me that there is a spiritual message you are trying to convey. Rather they function as a set of visual metaphors and symbols. MW: I once had this great discussion (with Hamza Walker from the Renaissance Society) - I remember we discussed the reoccurring motifs in some of my works that are - apparently - related to some degree to Christian imagery. Civilizations and cultures adopt visual metaphors to express the "mystery of existence" (and quite often very similar metaphors, such as baptism, an immersive experience of passage, which occurs across the cultures), but the question is rather what are these symbols conveying as opposed to which specific religion or culture produces them. On the other hand, with my Polish heritage, I did grow up immersed in Catholic tradition, strangely intertwined with Communism, and Western art, history and literature testify to the predominance of Christian agenda, hence, as a European I cannot help but be influenced at least to some degree. NA: What about your relationship to temporality? The performances you engage in are repetitive actions, they have neither beginning nor end, and have therefore more to do with continuity. In your conversation with William Anastassi about "Ennoia", you say that during your immersions you are mostly interested "in states of duration, endurance and continuity." In fact you are proceeding by "accumulation" which is a term that Eva Hesse often employed. Continuity is also manifest in the series of actions you develop over time, you don't just begin a series and move on to the next. Can you elaborate on this? MW: Since my childhood I have been obsessing about disappearance. Continuous disappearance of things relates to the infinity of choice, the open, empty white space in which we have to maneuver. In my performative acts repetition implies being beyond or outside time. Circular motion that I often employ is about the notion of return, the very slight, subtle change that occurs if you repeat things hundreds of times. These actions are more then, say the act of breathing, they are conscious, mental choices of limited (through self-imposed restrictions) behavior, like in drawing. When I perform the act in the installation or when I draw in my studio I literally don't know how many hours have passed. The shift in the understanding of time and space is something that I hope to share with others. NA: The integration of new technologies in your performative installations also impacts your relation to temporality. You edit your projected video and you compose your own sound but you also have collaborated with artists such as Steven Vitiello and Mathew Griffin. The resulting video and sound pieces combine live and previously recorded sounds. In Limen/Meadow, 2004 we hear a combination of the recording of a private immersion that took place in your studio- the sound of your body in the water-with paper that is being torn during the live performance as your body rolls back and forth on the ground. Vitiello refers to your performative installations as "sound drawings" which is a beautiful way of describing the interconnectability of all these practices. For an "Ennoia" he placed microphones inside the tank that were covered with condoms. Can you describe your involvement in the editing process for the audio and video components? MW: Preserving moments of reality, the impossibility of such preservation is another obsession of mine. In my performative installations, one experiences a combination of live and pre-recorded images and sounds. I am interested in shifting slightly the sense of time. My interest in technology allows me to combine the real time recordings with previous recordings of a similar situation in another context. These realities are very close to each other, overlapping at the edges. I edit in the same way I draw, implying a passage of time, erasing or overlapping certain parts. NA: In the 70's photography and video were used to record actions and performances for documentation purposes. In your performative installations, filmed actions record the temporal moment but they also take on a life of their own. They operate as a metaphor for memory and illusion, and I would say that they also allow you too interpret, represent, and mirror psychological states and processes including their breakdown. Why do you choose to film your performative installations from above? The camera is suspended to the ceiling and the resulting image is a bird's eye view of what is happening below, where everything is leveled out into a flat surface. MW: There is this aspect of looking "down" like when you come across an accident on the street, and people gather to "see" the victim, as an ultimate scene of vulnerability face to the violent gaze of the viewer. When I am in the vessel or lying on the paper, people see me almost the way the camera does, they bend over my body; they could even "cross" over it and walk "through" me. There is a violence in this aerial view as well as a reference to a painterly representation. The reality becomes a map, a drawing. NA: You often employ the term "liminality" when you describe your creative process. What does this word mean exactly? MW: Etymologically "liminality" derives from "limen" which means "threshold." It is related to words such as "limb" or "limit," basically things that connotes an edge, a boundary. The issue of liminality, of being on a threshold of something, is interesting for me. I think the body is such a threshold or place, in which we are suspended. NA: Let's talk about your most recent development, "Drawing Room (Achea Rheon)" (November 2003) at the Whitney Museum and the incorporation of children in the process. Was this the first time you invited them to be inside of your work? MW: I was invited to propose a work that would include the children, which I saw as a great opportunity. During the performance I realized that I was as much immersed in "them," as they were in my work with their unpredicted energy, their flow. Through my slow, gradual movement with my eyes closed, drawing with both hands simultaneously and with my head often touching the ground, I operated in that limited space of action. Many kids decided to follow, drawing in a similar way, lying on the ground, inside the drawing. There was this Lacan'ian state of being mirrored by the camera view and projection and by the sound. Together with Matt Griffin, we have incorporated the sound of my earlier private water immersion, the sound of my drawing action at El Museo del Barrio and the sounds of children playing outdoors. NA: As this discussion comes to an end, could you inform us about new projects that are underway. You are preparing a new "Ennoia" that will take place at the Kunstlerhaus Bethanien in Berlin over a period of two months and that will involve multiple immersions. You are also planning to develop a performative installation in the urban space, perhaps even in New York City? MW: "Drawing the City (Achea Rheon)" will be an action filmed from the rooftop. A large fragment of the pavement is covered with paper. I crawl and draw around my body. The pedestrians are invited to participate. In this project I intend to open the edges of drawing to the public space. The sounds of the street recorded at an earlier time will be mixed with the studio immersion in water providing a sense of public and private, past and present overlapping together. I am interested in what happens between the body and the architecture of the city, specifically the surface of my skin and the surface of pavement. Cracking paper will open itsef up to the underlying ground. I am interested in the questioning the stability of buildings or streets, in treating them as porous, overflowing. Where the private or intimate changes into public? Lying down in the space of the city connotes vulnerability. It's a gesture. It's also about becoming one with the ground, with the bird's eye view of the street.